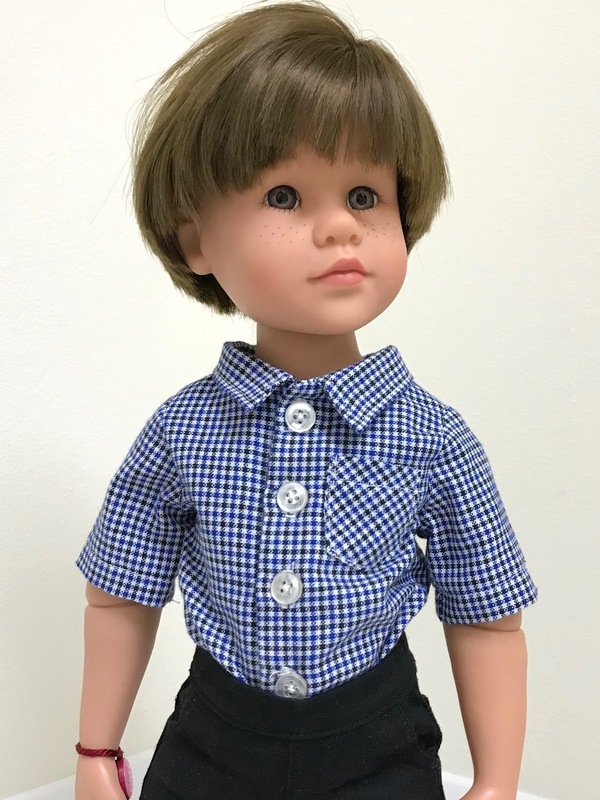 I've been putting my EverSewn Sparrow 15 through its paces on the doll clothes. I made Billy a dress shirt this week. 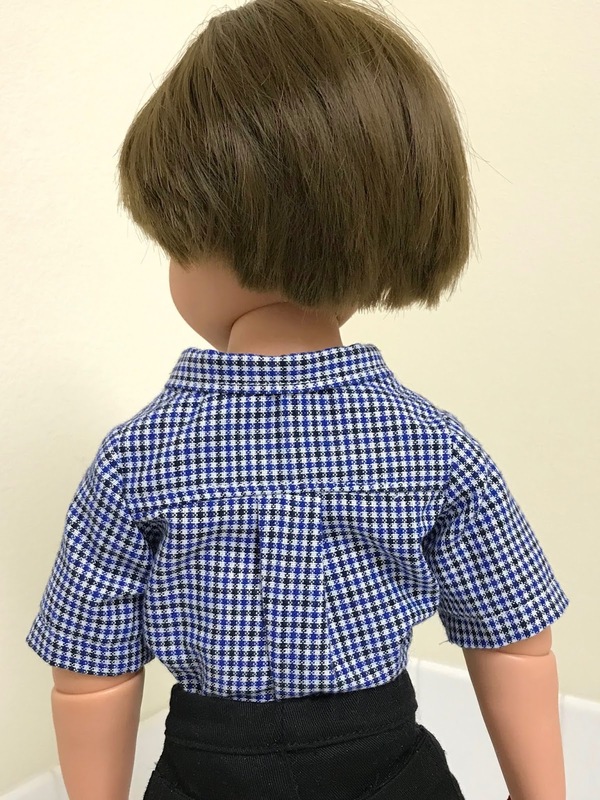 I used my Checkered Shirt Pattern and just made the sleeves short. 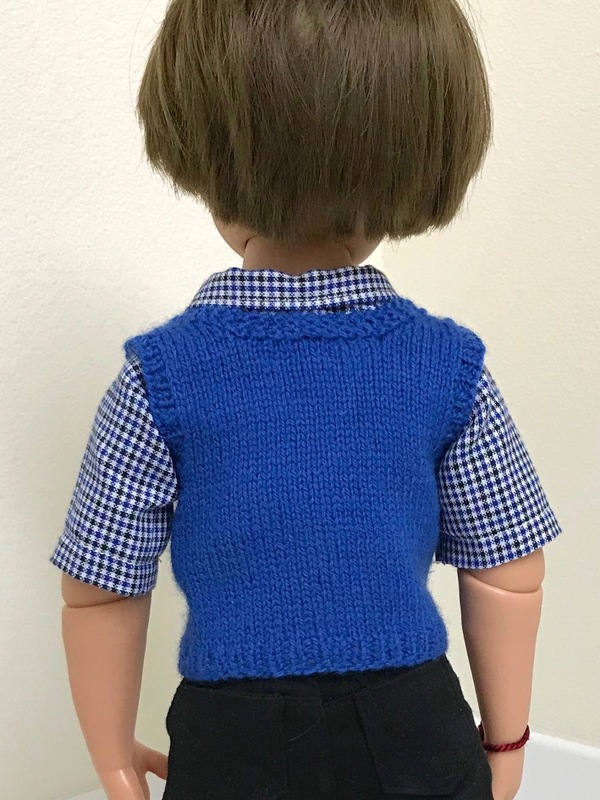 Then I made Billy a sleeveless cardigan (sweater vest) to wear with it. I spent some time this week working on the last clue for the Mystery Knit Along for the Rose City Yarn Crawl. I'm not done yet. I still need to weave in the ends and block. It was too late last night when I finished the bind off. We've had snow. Between snowstorms, we've had some sunshine and a few hours of pleasant weather. During some of these nice midday times, we have hit the dog part near us. Rocky and Dusty have really enjoyed those visits. It makes me happy to see Rocky running around like a younger dog. We live in an interesting neighborhood. I think I have mentioned that there is an airstrip for small planes at the end of our street. We don't have a lot of planes taking off or landing, but it's still in use. Recently a lady who didn't know about the airstrip saw a plane go down to land and thought the plane had crashed. She called 911. I think that was what prompted our local TV channel to post this segment, which aired Wednesday. I thought it was interesting. 1) Visit from someone from the people who are replacing some of our windows. A young man came to measure and see if we needed to take shades down. 2) The dogs went to the groomer. 3) I had a haircut. 5) I had choir practice. For some cuteness, I thought you would get a kick out of our youngest grandchild, Johan, who was getting ready to go to school. 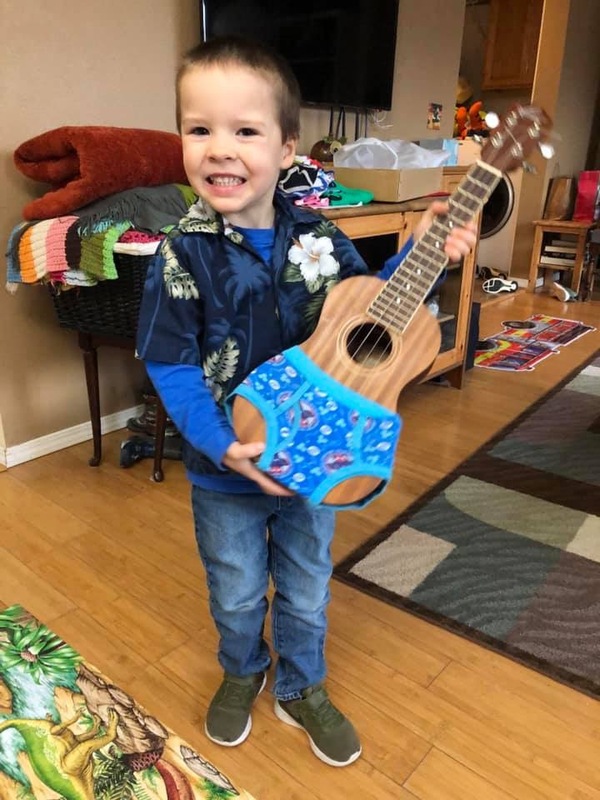 The sharing topic for the day was the letter U, so he put underwear on a ukulele. Cute. Billy reminds me a lot of Johan. Commercial plug: If you want to support the Girl Scouts but don't want the cookies, you can buy them from my Brownie granddaughter Daphne here and have them donated to the Ronald McDonald House. What's on my needles: Still the Mystery Knit Along for the Rose City Yarn Crawl, but getting close to done. What's on my sewing machine: Just finished a dress shirt for Billy. He needs a jacket, but I need to get some fabric for it. What's in my hoop: Still the Spring Flowers quilt. I hope to get back to it after the yarn crawl. 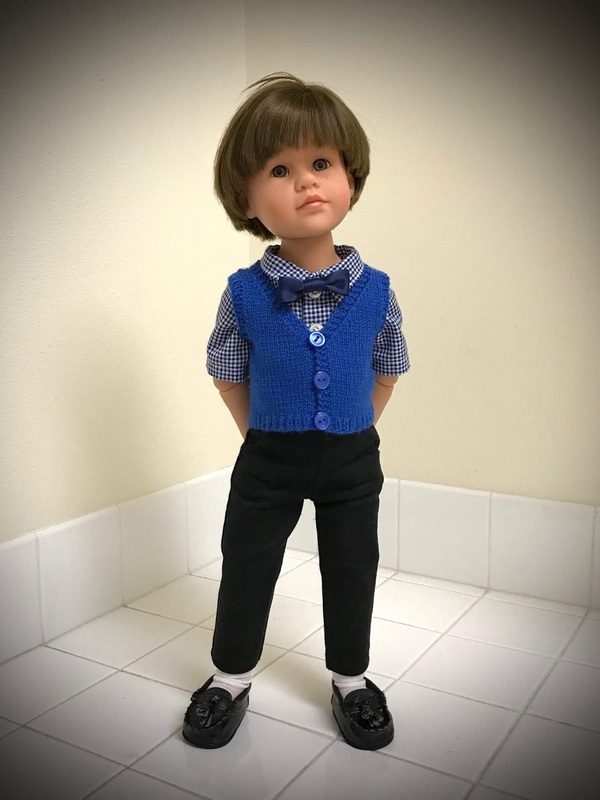 What's in The Doll's Storybook: Choosing and Chosen. Billy finds his calling. What's on my iPad/iPhone: Finished Winter and Rough Weather by D. E. Stevenson. (Another title for this novel is Shoulder the Sky.) Now listening to Andrew McCabe's The Threat. Very interesting to listen to. I think these former members of the FBI are good writers because they have to write up everything that happens to them in the line of duty. In detail. They also make good narrators for their own works, perhaps for the same reason. What's in my wine glass: Sierra Trails Old Vine Zinfandel 2017. Lovely. What's my tip of the week: If you ever make a small pot of tea in a small teapot using a tea bag, you have probably had the tag on the tea bag end up inside the teapot when you pour in the hot water. You can buy tea bags that don't have tags. You can pull the tags off. 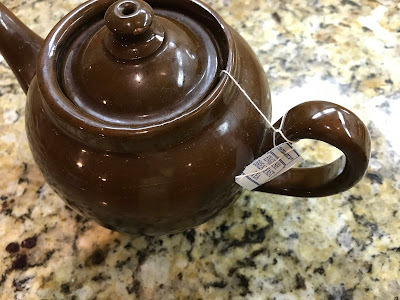 Or you can do what I do: wrap the tag around the handle of the teapot and tuck it under the string. No need to tie it. The tag will hold onto the string. Today's should be interesting. It's a report on the Yarn Crawl. I'm glad to be back on line. Had computer problems. I got a kick out of Johan's uke wearing shorts. Just too cute. I always enjoy reading your posts. Here in Maine we have been getting some big snow storms also. But this week is promising temps in the 40's so it will be melting fast. Love the pic of Johan. He is very creative. Must take after his grandma! I checked out the Rose City Yarn Crawl. They have some lovely patterns. There is a nice fairly new yarn shop in Columbia MO. I am going to suggest that she host a mystery knit along.